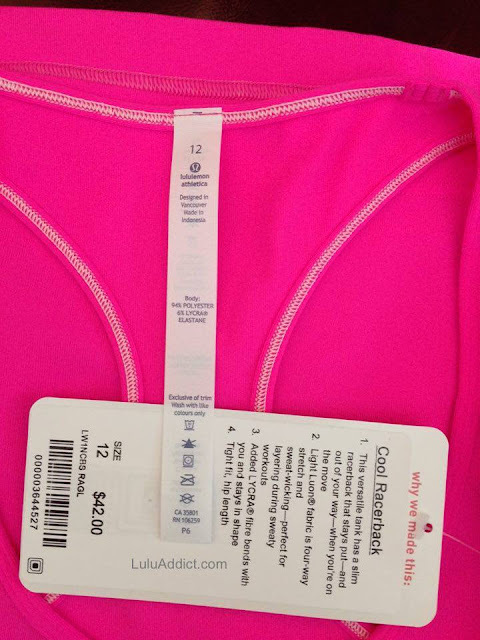 I didn't notice until this came up in a Facebook group but the Raspberry Glo Cool Racerback is polyester and not nylon. I don't think I've ever seen a solid colored CRB be made of anything other than nylon and spandex/elastane. I'll be returning this. If I want polyester tops I can go to Athleta. Boo! the tag stated 86% polyester and 14% Lycra. I quickly called GEC and they said I must have received the wrong pants or they were mislabeled, because Luon is a nylon/Lycra blend. Luxtreme is polyester/Lycra. I think they are changing the fabric content of Luon to save on cost. @ anon 6:32 pm - the prints always have polyester in them. Solid colors, however, had always been nylon. @ anon 6:27 pm - The CRB has always been made of light luon. Solid CRBs have typically been something like 94% nylon, 6% lycra. The heathereds have a percentage of poly, typically around 45%, and the prints are typically 90-something percent poly. I tried this one in-store and it fit me too tightly in my TTS; size-up was better. I prefer the mix that is in the alarming CRB (made in Sri Lanka) which has a bit more elastane if I recall. anon 6:32--Luxtreme also has varying fabric compositions and like WUPs, the solids are generally nylon/lycra blends, while the prints have high percentages of polyester in them. I stay away from the prints--even though I love some of them, I can't deal with the feel of the high-poly fabric. The new Raspberry CRB is the regular nylon blend and it's thick. I'm thinking that they made the raspberry glo CRBs with polyester due to color bleeding issues with previous shades of bright pink. Polyester retains bright colors much better and doesn't bleed when bright dyes are used. I definitely prefer Lulu's nylon shirts- I have tried to branch out and wear other brands again, but I just can't stand polyester! yeah i hate polyester!!!!!! they can keep their darn poly crap!!! I have a nice colection of the nylon ones and they will last till i'm six feet under they look good as new and some of them are 8 years old! @ anon 11:33 am - I got the Kayak Blue and that one is nice. I tried on the Raspberry and that one was nicely thick. @ anon 4:34 pm - Good point. That may be why they changed the blend. I was wondering why it felt so scratchy!! Mistery solved. I would never buy another one of these. Big upload to WMTM, but I can't say I saw anything I had to have. Much of the smaller sizes were already sold out. What did you all get? Still debating on the & Go Til Dawn dress. Any reviews? Worth it? Prices go up,quality goes down. This is the beginning of the end for companies that practice this.